Melinda Bula, author of Cutting Garden Quilts , is known for her stunning floral creations. 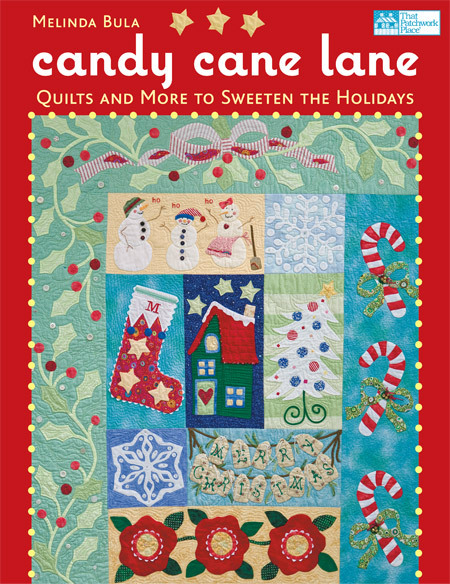 With her new book Candy Cane Lane, she departs from the art quilt to create sweet, whimsical holiday designs that can be used in a multitude of ways in addition to making the cute, cute quilt on the cover of the book. 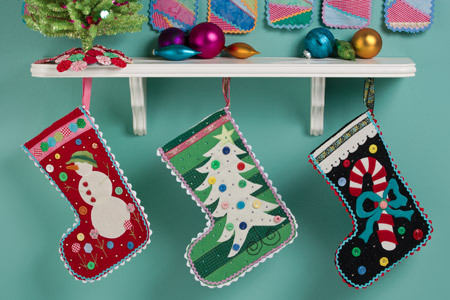 Look at these adorable felt stockings! 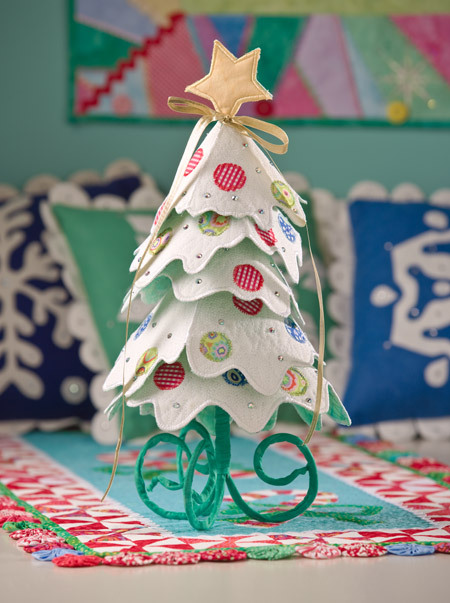 I love this whimsical ‘Who down in Whoville’ tree. It’s sitting on the candy cane table runner and you can see the snowflake pillows in the background. There are several more projects as well. Melinda encourages quilters to use non-traditional colors to spark up their holiday designs, and as you can see she does it quite effectively. The book includes basic information on fusible-web and needle-turn appliqué, as well as full-size pull-out templates for all of the appliqué patterns. Sweet! Only four months ’til Christmas! Boy, does this appeal to me! I’ve always loved the look of tole painting, Pennsylvania Dutch, Scandinavian, and every look of that sort. I asked Arlene to tell us a little more. Arlene: My unique perspective on design comes from my Slovenian heritage. I have always been attracted to the folk art of many European cultures and this is reflected in my applique designs. Slovenian Splendor by Arlene Lane. In Slovenian, as with other European cultures, the women would embroider their costumes with bright colored flowers and shapes. I transposed some of these shapes into appliqué and arranged them into a pleasant layout and designed the quilting to fit the quilt. Here’s a tip: When designing an applique piece, I usually incorporate a good number of small shapes or filler shapes as I call them. These smaller shapes offer me an opportunity to add a splash of color where needed and also fill in gaps between larger shapes. Kay: Thanks Arlene! 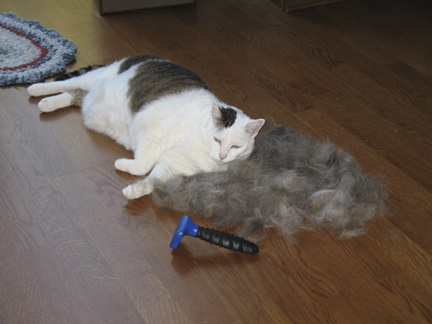 There are many more beautiful patterns at the Quilted Comforts website. Enjoy. The AQSG is a scholarly organization devoted to preserving quilt heritage. Every year they have a big seminar, where quilt enthusiasts, historians, researchers, collectors, authors, folklorists, curators, dealers, and traditional and contemporary quilt artists get together for a few intense days of engagement with quilt history, social context, and design. The seminar travels, and this year it’s going to be held in San Jose, just ‘over the hill’ from here. Several of my friends are members and there’s some big excitement that the seminar is coming to northern California. I volunteered to help out so I might get to be a fly on the wall. The seminar takes place October 1-4. For more information and registration forms, go to the AQSG website and click on Seminar.